In what feels like the beginning of a modern-day prodigal son (or in my case, daughter) story, my father has given me his blessing to be a Dodgers fan. He left a voicemail for me the other day, and it’s just too good not to share. Note: He starts the voicemail speaking in a low, melancholy tone. Hi, Emily! Can’t take my call? This is Dad calling. Calling ’cause I’m worried about you, and I’m also worried about some news on Facebook. There was one that was very disturbing to me. It, ah, seems like you’re becoming a Dodgers fan. It’s… It’s pretty evident to me. So, I want you to know, I let you go. I will let you be a Dodgers fan. You’ve been living in L.A. for a while and you probably should embrace the local team. Like I did when I moved to San Diego! I grew up a Dodger fan, as you know. But then I moved to San Diego. You grew up a Padres fan, and you moved to L.A. It’s okay. (big sigh) I’ll get over it. If that’s not a father’s love, then I don’t know what is. 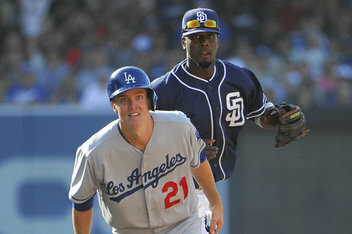 ** I would like to clear up for the record that I’ve not yet traded the last-place Padres for the first-place Dodgers. Tonight, in fact, I’m going to the Angels game (my roommate is from Texas). I left a follow-up voicemail for my dad telling him that at no matter who is playing, deep down at the root of it all, he instilled in me a simple love of the game.